Garage48 Tbilisi 2017 started on a sunny Friday evening with 70 participants at Rooms Hotel Tbilisi, where we kicked off our hackathon! There were 22 ideas pitched, out of which 17 teams were formed. Below are the ideas that were submitted for development and who will work towards creating a top notch prototype for the Sunday’s Grand Finale! Rehab glove for patience to recover and rehabilitate more effectively. Vizualising knowledge. 3D visualized physics, chemistry et al. Using LIFI build demo using only lights. Develop coding skills in children. Module allows doing miniprograms. A battle game where you shake your phone as hard as you can. The one who wins gets the food. E-book reader for blind people. Android application that uses arduino to react to music. Trash can that rewards you for recycling. Application that connects to WIFI only when the app is installed. Exchange infromation by WIFI, information against points. App that connects you with random people for lunch in your area. 3D printer that prints a product entirely in seconds. Platform that will connect upcoming artists from around the world. Structured by themes/fields. Mobile app, gaming, social function. Will allow users to play a game with populating Tbilisi with trees. Social impact is whenever a tree is under a threat, they can alert other users. Problem to solve is lessening the amount of trees. AI assisted financial analytics tool that will help you with stocks and will make everybody a millionaire. Big thanks goes to all of the teams who had the courage to pitch, but didn’t get submitted this time! You did great! 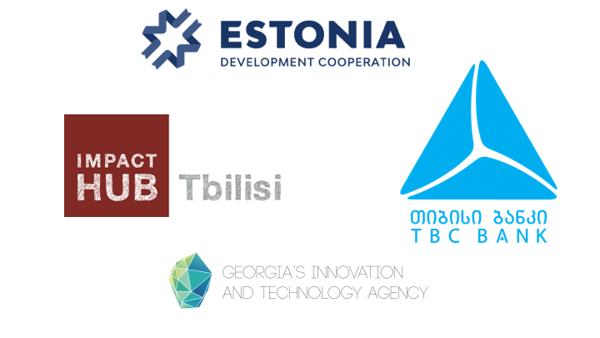 Follow us on Facebook to get information about our hackathon in Tbilisi! Show your support and see the final demos on Sunday, April 23 at 5:30pm Tbilisi, Georgia time! Thank you to our Sponsors and Partners who are helping us make the magic happen!